I was driving home tonight on the Mass Pike as the night darkened. 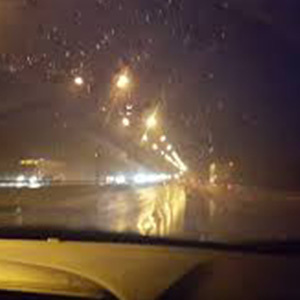 Torrential rain pounded on the car, with the temperature hovering at 34 degrees. I was trying to cautiously race against the darkness and the predicted freezing rain, to arrive at Exit Two before either descended. Clutching the steering wheel with a bit too much eagerness, tensing against the huge trucks barreling past me in the passing lane impeding my vision even more, I heard myself mumble tiny curses under my breath. Then I cursed the trucks again. Driving more slowly than normal to respectfully accommodate the weather, noticing the tension gathering in my shoulders, I just kept breathing. I did not receive instant relief, but I was able to soften around the experience, the culmination of a long, strange and stressful day. I was able to find gratitude, a fantastic tool, which gave me a lighter, a more aerated perspective. Thank goodness it’s not icy yet. So grateful to be on the road now, not in a few hours. Oh, Lee, Ma! Only twelve more miles. Gratitude consistently softens me, eases me, helps me. It got me through the long, seemingly endless hour’s drive. Finally arriving at home, I crawled out of the car, exhausted and relieved. Tension, that inevitable partner of ours, came along with me. Do you want to be relaxed? Cultivate the strategies to befriend the tension. Once home, once dried off and releasing the invisible steering wheel from my hands, I was able to find my metta meditation practice. There are so many renditions of metta, lovingkindness. This one has carried me through the inevitabilities, the countless tensions of the years. No matter what I’m given. No matter what you’re given. May we ride the waves of our life. No matter what we’re given. And now, breathing and relaxing, let’s together let go of the outcome of our prayers, so we might be right here, right now, with life, as it is. Take a few breaths, with me. After a few minutes of this prayer, the Mass Pike was behind me. Although I was fatigued, I found my way toward the shower, toward a good-enough book, and actually, eventually, shockingly, toward some sleep. Prayer doesn’t change reality. It just softens our hold on it. Practices don’t prohibit tension. They simply open the doorway for our journey through the feelings. In this lovely moment, I acknowledge the sacredness of both tension and relaxation, of fear and faith, of hopelessness and hope. All are sacred, all inevitable, all, indeed, are ours! Give me a moment or two. I’m sure I’ll forget.